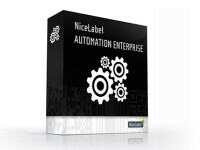 NiceLabel Automation Enterprise is designed to integrate label printing into SAP, Oracle and other leading enterprise applications. The world’s largest organizations rely on NiceLabel to achieve label and brand consistency, secure centralized control and meet regulatory requirements. NiceLabel helps enterprises maximize supply chain efficiency, cut costs and increase customer responsiveness. NiceLabel Automation Enterprise supports an unlimited number of printers making it affordable for you to automate all of your printing infrastructure. Connect business applications, such as ERP, WMS, SCM, MES and PLM to your label printing infrastructure. All applications across all divisions and locations in your enterprise can now consistently print authorized label templates. Return real-time printer and print job status to the requesting business system. Standard interfaces to mainstream and legacy systems eliminate the need for costly and time consuming custom programming. The high throughput print engine can simultaneously handle thousands of print requests to globally distributed printers. No scalable, per-printer, licensing costs like competitive labeling software offerings. The optional Control Center Enterprise provides a traceability layer for the label template design process that is required for medical, pharmaceutical, biotech, manufacturing, and other industries. It includes a secure central storage repository, file archiving, file versioning, approval workflows and print history. Use our professional label designer to make label changes quickly and easily. NiceLabel Designer Pro reduces design time from weeks to hours. It helps you easily implement customer-specific requirements and drive customer responsiveness. Business rules simplify integration so you don’t have to modify or customize your existing enterprise application. This cuts implementation costs and simplifies maintenance. Use rules to select label formats, languages and printers based on data attributes, print multiple labels and actions from a single request. Enterprise applications rely on label templates that contain a specific printer’s command language or form designers built for laser printers. While these approaches do work, they impose many limitations that prevent achieving label compliance and brand consistency, especially across multiple brands of thermal printers. Some of our customers print millions of labels per day and downtime is not an option. We achieve maximum performance and system stability by developing our products using the latest 64-bit Microsoft technology. Add Microsoft certified native thermal printer support, for 2500+ models, to your Enterprise applications. Enhance and maximize printer performance across your organisation. Trigger printing, from your applications, using certified SAP and Oracle interfaces without the need for additional programming or customization. As an elite Microsoft Gold certified partner, NiceLabel has the experience and technology to offer the most advanced server-side printing solution. With over 20 years of industry leadership, our designer, certified windows drivers, output management software, rich internet applications and global presence drives the world’s largest companies top line revenue growth, maximizes supply chain efficiency, cut costs and increases customer responsiveness.